Ph.D. Student Breaks Down Electron Physics Into A Swinging Musical John Bohannon, founder of Science magazine's "Dance Your Ph.D." contest, presents the 2018 winner, Pramodh Senarath Yapa. He won over judges with his choreographic rendition of some chaotic electrons. Thanks in part to his original songwriting, singing and guitar-playing, Physics doctoral student Pramodh Senarath Yapa beat out the remaining entrants to win this year's "Dance Your Ph.D." contest. It took Senarath Yapa six weeks to choreograph and write the songs for "Superconductivity: The Musical!" — a three-act swing dance depicting the social lives of electrons. The video is based on his master's thesis, which he completed while pursuing his degree at the University of Victoria in Canada. The 11-minute sing-songy rendition is far less paralyzing than the jargony title of Senarath Yapa's thesis alone: "Non-Local Electrodynamics of Superconducting Wires: Implications for Flux Noise and Inductance." "Superconductivity relies on lone electrons pairing up when cooled below a certain temperature," Senarath Yapa told Science. "Once I began to think of electrons as unsociable people who suddenly become joyful once paired up, imagining them as dancers was a no-brainer!" 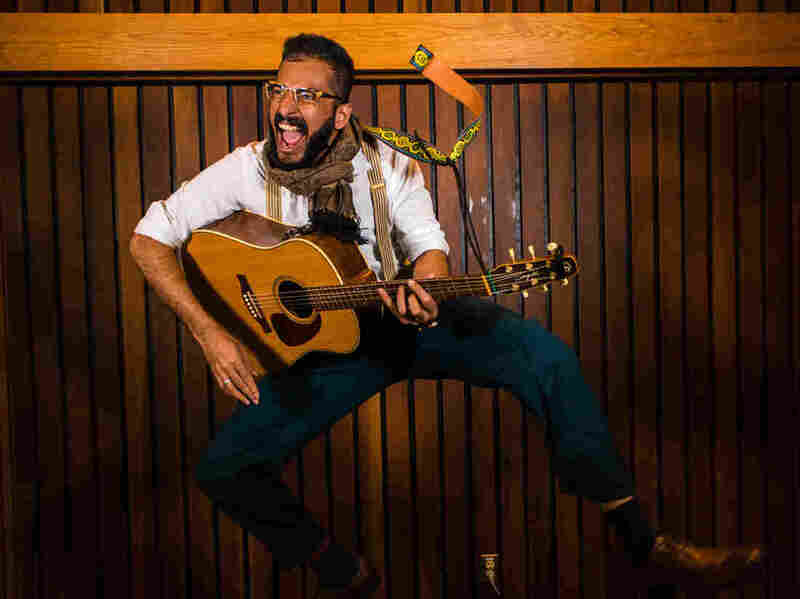 Senarath Yapa, who's been swing dancing for five years, and playing the guitar for 13, says he cast some of his swing dancer friends as the "shy" electrons partners and the aggressive "punk impurities." Dancing To The Tune Of Ph.D.
John Bohannon, a former contributing correspondent for Science, founded the contest, now in its 11th year. It all started at a party one New Year's Eve that was heavy on scientist attendees and light on the dancing. "I tapped into their competitive spirit," Bohannon tells NPR's Scott Simon. To get them up and dancing, he turned the party into a dance contest where the party-goers had to show what they were working on without using words. He thinks scientists are apt performers to begin with. "I think in general, they're exhibitionists. If you're willing to stand up and defend some crazy obscure research topic that you've devoted her life to then there's probably something in you that wants to dance." A 100-judge panel of acclaimed scientists and artists, which grades finalists on both artistic and scientific merit, picked Senarath Yapa as the overall winner and the winner of the physics category. The field of 50 entrants was competing in five categories: biology, chemistry, physics and social science. While Bohannon may not be able to speak to what caught the judges' eyes, he says Senarath Yapa nailed the purpose of the contest: to simultaneously educate and entertain. "His dance was just really funny and fun to watch and you can't help but sort of tap along as you learn," he says. "The thing that really tipped it was on top of all that, he wrote his own music and then performed it."